NEXT | The Queue: Don't you recognize me? We can’t all be heroes – and some of us were never meant to be. While Jesse McCree’s history has been a little shrouded in mystery, his past as a member of the Deadlock Gang was given more definition at BlizzCon 2018. There, we saw what the gunslinger’s been up to since that recall order Winston sent out – and we were witness to the reunion of a couple of old…friends? Maybe not so much anymore. When McCree was captured by Overwatch, he was given a choice: Rot in a cell forever, or join Blackwatch and work for Overwatch instead. He chose the latter, and quickly became one of the more useful members in Reyes’ band of undercover operatives. But in doing so, he left behind his former allies, and they were none too happy with his new choice in occupation. Nobody was more irritated than the Deadlock Gang’s leader, Elizabeth Caledonia “Calamity” Ashe. Ashe wasn’t always a criminal. In fact, she came from a life of luxury. Born into wealth and surrounded by privilege, she had everything she could ask for — except perhaps the love and attention of her parents. Both were highly sought-after business coaches for powerful CEOs around the world, which left them little time to spend with their daughter. Maybe it didn’t matter to them. 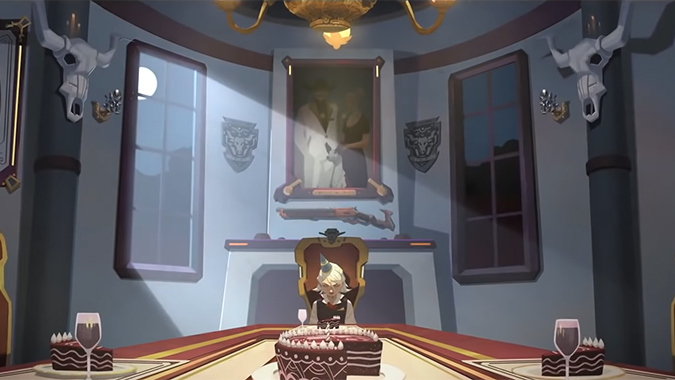 They left her with a caretaker — an omnic butler named Bob. Certainly he’d be enough to raise her correctly, right? Not so much. Predictably, Ashe began to act out, and not even Bob could stop her from getting into scrapes. Although her parents left her with every possible opportunity to succeed, Ashe eventually struck out on her own – well maybe not quite alone, she had Bob at her side, of course. At some point she met up with a local troublemaker named Jesse McCree, and that’s when her life changed for good. Who was McCree, before the Deadlock Gang? A ruffian, a criminal of sorts, or maybe just a thrillseeker – either way, he and Ashe went on an impromptu string of crimes that opened her eyes. Certainly, she had every opportunity to succeed…but there was something to be said about the thrill of outwitting a target, taking what she wanted, and getting away with it all. Ashe might’ve been born with a silver spoon in her mouth, but she spat it out in favor of the dust and wide-open roads of the deserts, and the illicit thrill of life on the other side of the law. But two people can only go so far where crimes are concerned, and Ashe wanted more. To that end, she formed the Deadlock Gang, joined by McCree and two other individuals – as yet unnamed – and began making more and more elaborate heists. And they were immensely successful at it. The rapid rise of the Deadlock Gang pitted them against other criminal organizations, often resulting in violence and bloodshed. But Ashe wasn’t just a thug – she may have been deadly, but she was also clever and had years of business acumen at her fingertips as well. Eventually, she called a meeting of all the leaders of the major criminal groups in the area, and made a business proposal. Set against each other, none of them would prosper. Working together – or at the very least, alongside each other – they could accomplish far more. Ashe was a woman of principles, after all. Keep your word, don’t work with the law, respect each other’s territory, and always, always punish betrayal. As long as that was followed, everyone would prosper. And they did. In fact, the Deadlock Gang was so successful that it eventually drew the attention of Overwatch. 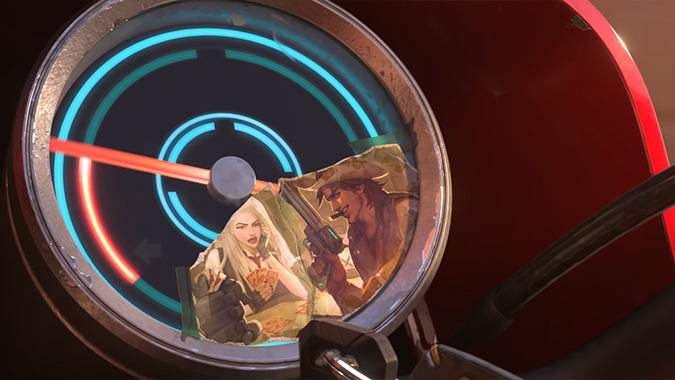 While they may not have managed to capture Ashe, they caught the next best thing – McCree, her partner in crime. Suddenly, Ashe had a different problem on her hands – the man who sent her down this path was working for the law. As far as she was concerned, it was a betrayal…yet it appears McCree managed to escape punishment at her hands. But if the photos on her bike are any indication, he hasn’t escaped her thoughts, even years later. 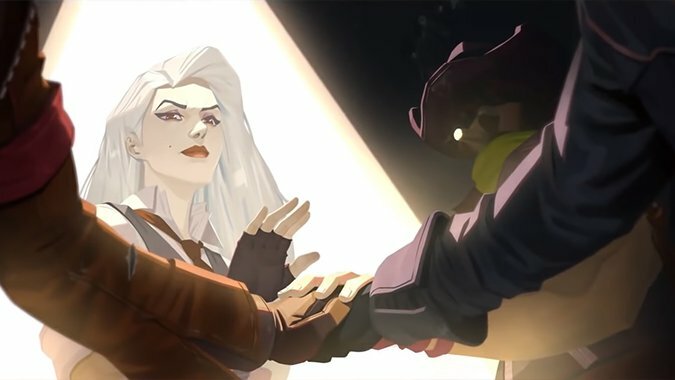 Although Ashe and McCree’s reunion may have been explosive, it’s the other presence in the animated short that is of immediate interest. Simply named Echo, this omnic was apparently being shuttled from one location to another for unknown purposes. But she has a history with Overwatch, and a history with McCree – she recognized him on sight the moment he activated her with the chip he mysteriously had in his possession. It doesn’t appear that Echo knew about McCree’s missing arm – which raises the question, when exactly did McCree lose it? He still had both arms in the cinematic for Retribution, and the Uprising comic as well. It’s been implied that McCree left before the explosion at Overwatch’s Swiss headquarters, which makes me wonder – did McCree lose his arm while he was with Overwatch, or at some point after he left the organization? In other words, Vishkar hasn’t really been seen as good news as far as Overwatch’s story is concerned. Where does Echo fit into that equation? Did she escape from Vishkar? Is that why she was in the pod? Why did McCree have her activation chip? Was she a part of Overwatch at all, or someone who McCree helped after he left the organization? When McCree made that crack about the monkey, Echo didn’t seem to know who he was talking about – and she didn’t get the recall order. Was it because she was deactivated, or because she’d never been a part of the organization in the first place? We may have a ton of questions after the events in Reunion, but the short was a good one. For the first time in a while, it’s pushed Overwatch’s narrative forward from Recall, instead of filling in bits and pieces of the past. 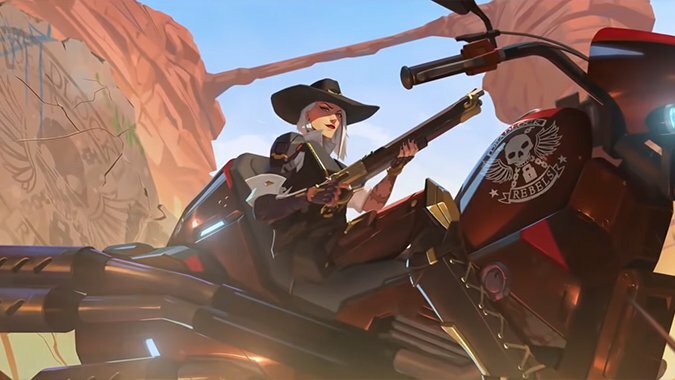 Ashe is a compelling character, and her backstory managed to fill in a little more of McCree’s origins as well. Where’s McCree headed now? Well…it doesn’t appear to be back to Overwatch — at least not yet. Echo is an interesting enigma — her introduction gave us very little to work with as far as details, but left us with a boatload of questions in its wake. While it’s uncertain when Echo will hit Overwatch’s hero roster – she won’t be hero number 30 according to Kaplan – her story is one to watch out for. 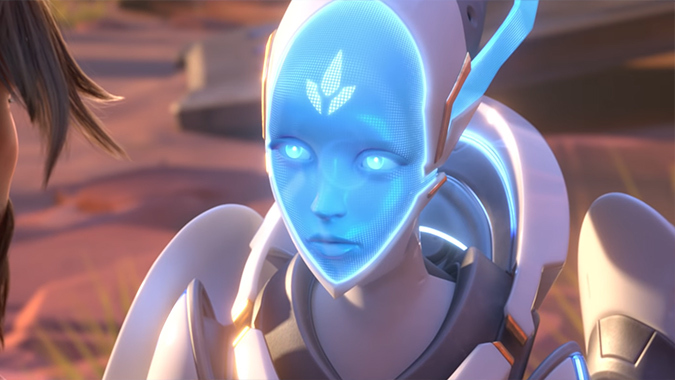 Hopefully we’ll see more from her in the months to come, as well as the slow continuation of Overwatch’s fascinating narrative.